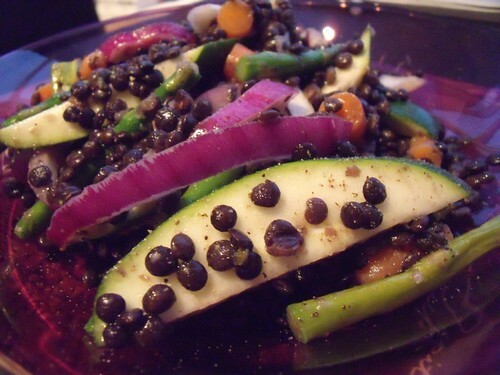 When I made my lentil & beet salad, I made sure to make extra beluga lentils to have on hand for the next week of meals. I ended up making some super quick & vegan Chipotle “Snobby Joe’s” (lentils & tomato sauce on a bun), and this asparagus salad. 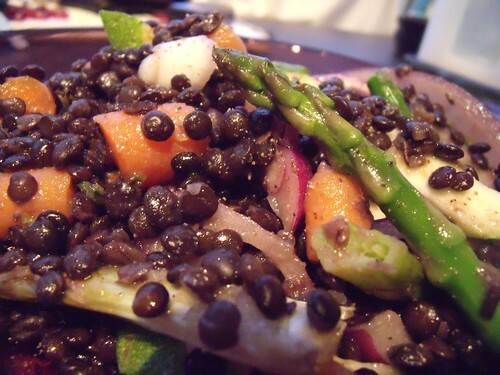 I love how the beluga lentils keep their shape here, and add a textural interest along with all the fresh veggies. Feel free to toss in any veggies you have on hand — the recipe below is just a guideline for what you can do. If you’re trying to eat low glycemic index foods, this salad will do you well, and keep you sustained too. Toss the asparagus with olive oil, and place in a preheated grill pan over medium-high heat. Cut into 1″ lengths, and add to a large bowl along with the other veggies and the lentils. Combine the salad dressing separately, and toss with salad. as always, looks gorgeous, and sounds beautiful!